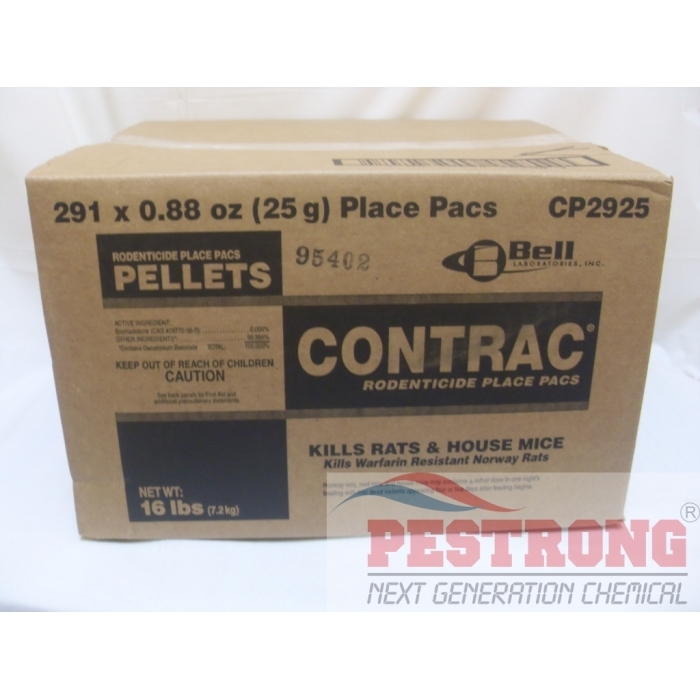 Where to Buy Contrac Pellets CP2925, Contrac Rodent Place Pacs - 291 x 25 Gram - $124.95 for Sale with Fast Free Shipping! Contrac Rodent Place Pacs - 291 x 25 Gram with the active ingredient, Bromadiolone, is a fresh tasting, highly compressed pelleted bait that holds up well, particularly in adverse or moist conditions. 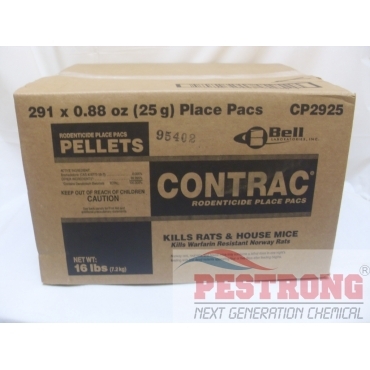 Contrac Rodent Place Pacs - 291 x 25 Gram with the active ingredient, Bromadiolone, is a fresh tasting, highly compressed pelleted bait that holds up well, particularly in adverse or moist conditions. Made from an advanced formulation process, Contrac Rodenticide gets superior rodent acceptance and control, including control of Warfarin-resistant rats. Contrac Rodenticide comes in pre-measured polyglassine place packs that keep pellets fresh and free from contaminating odors. Rodents open the place pacs with their gnawing. The slender place pacs can be used in hard-to-reach locations or in bait stations placed along rodent runways and. Packs can also be opened and loose pellets poured down burrows. I have had some rodent problems, nothing too crazy but enough to warrant an attention. Instead of calling in the professionals, I gave this product a try. I placed these packs all around the warehouse and, soon enough, I noticed that I saw less and less rodents. After 2 weeks of application, I have not seen a rodent. I appreciate the targeted formula and the relatively long shelf life. Just give it a couple days to determine the effectiveness. We have been using these for a while now and the results are excellent. This is very easy to just place around the vicinity and kill off the rodents. I constantly have extensive rat problem at my house, and so instead of calling the exterminator like I usually do, I tried to do it myself. After doing some research I decided to purchase this product, and this thing works super well, now I know I don't need a fancy exterminator for rat problems anymore! It works, I got severe rat problem. But after I just drop a few of this pellets, all problem has be gone. Thanks.